Lazaretto Point Lighthouse (Replica)* – Chesapeake Chapter U.S.L.H.S. 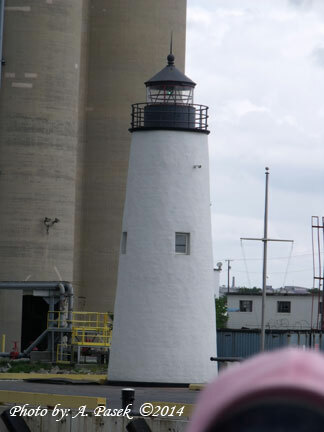 In 1985, the new owners of the Rukert Terminals Corporation, (the son and nephew of late Norman G. Rukert Sr.) decided to erect a replica of the Lazaretto Point light to honor Rukerts, Sr.’s memory. He had been a historian and a person who had loved the Baltimore waterfront. The replica was built from the original plans that were found at the National Archives. The light is now on the end of the pier of the Lehigh Cement Corporation. The light is located on private property but if you are lucky, you can drive to the light.